Despite the corroboration of suppressed evidence and a possible feasibly small conspiracy, I do not support that most official evidence is tainted. However, key moments and official assertions are deficient in my view and require further study and comparison with the facts. Namely, the assertion by the President's Commission that Lee Harvey Oswald regularly practiced with his Carcano rifle on a regular basis.i This idea while supported by many critics of conspiracy is not as reliable as some imagine. After his arrival in Russia Oswald did join a hunting club according to Marina, but never went to the practice meetings.iv During his stay in Russia, Oswald hunts "about six times" and Oswald went on a single hunting trip with Marina but he did not want to take the rifle along. Mariana asserts he took the rifle because "...one of my friends was laughing at him and said 'You have a gun hanging here and you never use it. Why don't you bring it along and see if you can use it'"v vi Marina later asserts he sold the hunting rifle upon his return to America but Oswald goes hunting a final time with his brother Robert using a borrowed rifle. During his years since leaving the Marines, he has actually fired a rifle on less than a dozen occasions and this does not resemble the highly proficient status critics attribute to Oswald. The Commission states distributor Crescent Firearms shipped the Carcano to Klein's Sporting Goods to have a scope mounted. It was a surplus military rifle, yet it did undergo a refurbishment and was test fired and found to be in working order and priced at 19.95. According to the Commission, the Carcano is shipped to A. Hidell and the rifle is sent to Texas on March 20, 1963.vii Additionally consider the two to seven days for delivery, Oswald received the weapon no earlier than March 22, 1963. 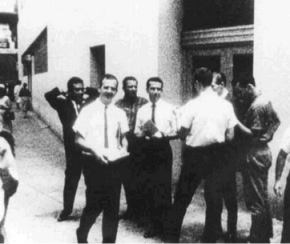 By late September the Carcano was stored in Paine's garage wrapped in a blanket and thus Oswald only had six months in which to practice.viii Officials state Oswald fired at General Walker on April 10, 1963 and this would imply Oswald had less than eighteen days to prepare. He according to the Commission made the attempt and failed and Oswald allegedly made a single missed shot upon the stationary Walker with time to aim. Marina further states Oswald buried and left the rifle multiple times before and after the Walker attack and these burials remove additional time. Marina stated during testimony to the Commission that Oswald and she had a domestic incident about "10 to 12 days" after the Walker shooting. It occurs three days before they left for New Orleans and Marina does not observe him with the weapon again until the summer of nineteen sixty-three.ix x The Oswald family moves to New Orleans and excluding the move time, Oswald now has just about five months left. In New Orleans, many of his well-documented activities include handing out fliers for the Fair Play for Cuba Committee but Oswald never attended a meeting. Federal Bureau of Investigations files reveal the group held all meetings in New York, no chapter existed in New Orleans and Oswald was not an official member.xi He allegedly went to political meetings, possibly staged a public brawl and then faces arrest. Oswald requests and subsequently was interviewed by an agent of the FBI and no witness observes him firing a rifle in New Orleans. Indeed Marina did claim that Oswald stated he was practicing with the rifle, yet the evidence for this is not present. Consider that Oswald denied his guilt and ownership of the Carcano and Oswald also claimed to be a patsy, thus his many contending statements infer he is not a credible witness in my view. Reasonably, we cannot value his word over the consistent evidence and the related statements of George De Mohrenschildt similar to Marina rely on Oswald's credibility.xvi We largely have Oswald's word he practiced and that is not sufficient evidence and the Carcano is stored within a blanket according to Mr. Paine and Marina Oswald. Subsequently, Oswald travels to and from Mexico City and is out of time for regular practice. The residue and use the Commission attributes to Oswald was from a prior owners use and evidence and testimony agree Oswald cleaned the weapon far more than he used it. Commission evidence demonstrates Oswald did not regularly use or practice with the Carcano and this inconsistency supports Oswald is a deficient sniper. It is highly improbable without consistent firing practice Oswald could make all the shots alleged within the given period.